Joy H. Blastoff to the sky and become a Rocket reader with this Super library. This is the best library ever. You don't even have to have a "library card"!!! 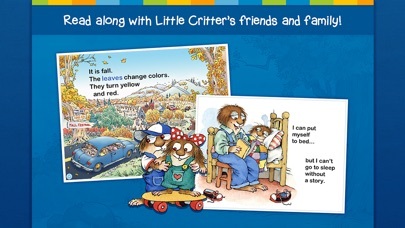 It has many adventurous stories and fun ways to reassure young kids being good is fun!! The music is thrilled and exiting. The characters are real- looking. 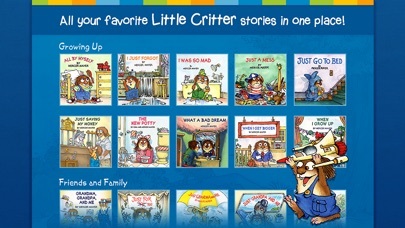 The stories are designed in such a cool way that kids can learn to keep calm, ask for help, and be nice!!! You can take this everywhere- on the go, in the car, on the bus, while traveling and before bed!!! Play a cute game of creature hunting in every story. One even has egg hunting. Press the pictures and learn new words. This library is the library of the year!!! Don't miss out!!? Very addicting and like hanging out with 🐶s. Happy readers!! I purchased the lifetime subscription and haven’t had any new books added in a long time. My children have all of the ones in the app memorized. When can we expect new books to be added? Thank you. Annoying renewals. Doesn't link up with iPod iPad w same iCloud. My son loves all these books. They are the best, they are entertaining and educational too. I Mercer Mayer. I love the books, but the subscription problem. I read books all the time & I do not stop reading all the time! I also read books in the “real side” because they are good for kids! Although,... WHY DO I HAVE TO PAY FOR SUBSCRIPTION!?!? I just really want books for free, but I HAVE TO PAY FOR IT TOO!?!? I like the app, but miss the ability to 'play' on each page like with the cd version. 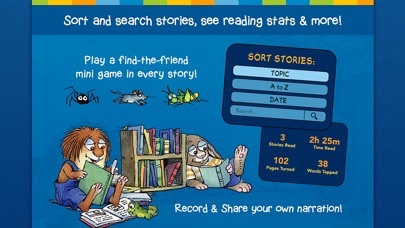 This app is very easy to use and has all of the options I was hoping to find (read to me, read by myself, and auto play). 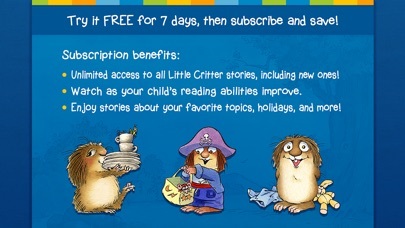 The app offers a subscription, or you can purchase the complete library for lifetime access. I chose the latter. We love all of the books. This will be a favorite with my kids for a long time! So pleased with this purchase.